I know it is bad to start off a collecting article with a warning but I am because I've been burned twice on this thing and I don't want anybody else suffering the same fate. 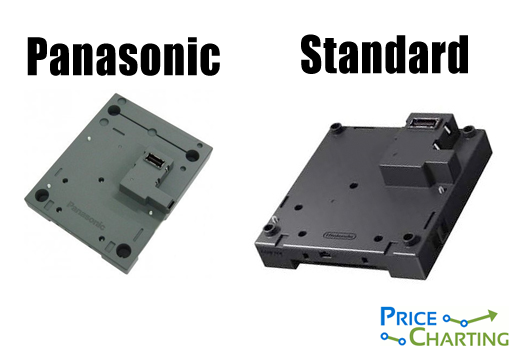 The Panasonic Q is a fragile and fickle machine. The disc drive is extremely prone to breaking or malfunctioning and easily cracks during transit. Since this is mostly an import buy, the "breaking in transit" is a major concern and insurance on the item is advised. Buyer beware. Otherwise, this is an amazing and beautiful piece of interesting Nintendo history and hardware that makes a great visual centerpiece for any collection with its polished front and bright blue LED's. The Panasonic Q is a Nintendo GameCube/DVD player hybrid machine that is capable of playing DVD'S, VCD's, GameCube games, and MP3's on CD. There were two versions released, one for ¥41,000 JPY that played only JAP-region GameCube gamesand Region 2 DVD's while a modified version was priced at ¥46,000 JPY that played Region 1-6 DVD's and NTSC and JAP-region GameCube games. The modified version was intend to attract import buyers from the USA since the console was only released in Japan. The history behind the creation of this machine is rather interesting. 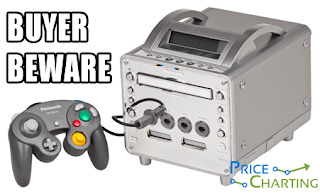 Nintendo worked with Panasonic to develop the optical drive for the GameCube but part of the deal was that Panasonic would be able to develop and sell a DVD-player that could also play GameCube games. Nintendo saw no problem with this and green-lighted the plan. Of the 4.04 million GameCubes that sold in Japan, less than 100,000 of them were Panasonic Q's, thus making it a rare and collectible item. The poor sales due to it competing with cheap DVD players and the standard GameCube culminated in the console ceasing to be produced in December 2003. The Panasonic Q was a really powerful and cool piece of hardware. It featured a back-lit LCD screen, a front-loading (and extremely fragile) disk drive, supported Dolby Digital 5.1 surround sound, had a separate sub-woofer jack for more bass, and could be operated by remote that was shipped with it. The Q could also use the broadband and modem adapters and had the appropriate ports to use them. The long "feet" of the console prevented the use of a standard Game Boy Player so a special version was released specifically for the Q. This add-on is so collectible that it usually sells for more than the Q itself at around $500. Another cool and collectible piece of Panasonic Q hardware is the special controller. It is just a standard GameCube controller with a special color and label but they can sell for around $50. The console can easily be found on eBay for around $150 but complete in box with remote and controller will cost as much as $400. It is a cool, fun item but like I said in the first paragraph, be careful. These things contain a lot of moving parts and the more moving parts, the better chance one of them will break and you'll just end up with a very pretty paperweight. Sounds pretty cool. Wish the standard release was this but without the flaky drive. I don't care for the system itself but I would love to get my hands on one of those panasonic Q controllers to play with on my standard purple gamecube.